Oxford United striker Danny Hylton says the club's appearance in the Johnstone's Paint Trophy final at Wembley will be "a day to remember". The U's booked their place in April's final despite losing Tuesday's area final second leg against Millwall. 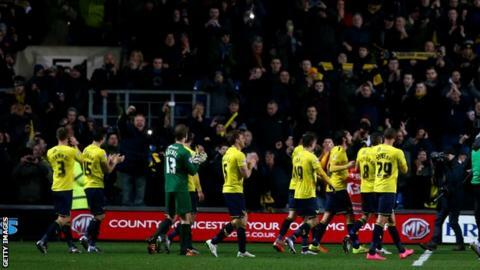 Oxford beat their League One opponents 2-1 on aggregate to book their third-ever visit to Wembley. "I've never played at Wembley before and I'm just over the moon to get the chance," Hylton told BBC Radio Oxford. Michael Appleton's side lost 1-0 to Millwall at a sold-out Kassam Stadium after Lee Gregory gave the Lions hope of overturning the two-goal deficit from the first leg. But the visitors had defender Lee Beevers sent off for a second yellow card after he brought down Hylton on the break. "We're having a season to remember," added Hylton. "We know what we want to do this year and we're not going to get carried away. "This is a little bonus for us and a distraction from the league." Oxford, currently third in League Two, will face League One opposition in the final in either Fleetwood or Barnsley on 3 April. "It's often a competition that clubs don't take seriously in the early stages," said Hylton. "But we have and it shows the strength of our squad. We've rotated a bit in these games and it shows whoever plays is more than capable."